Name: Amber Waves of Grain - "Amber"
Amber Waves of Grain - "Amber"
"Amber waves of grain" comes from the lyrics of the American patriotic song "America the Beautiful," first written in 1893. Amber is a skilled home companion to a Military family! Amber is NO LONGER AVAILABLE FOR ADOPTION! Amber is a three-year old female (spayed) golden retriever. She weighs approximately 65 pounds and has a short, easy-care coat. She is outgoing and affectionate. 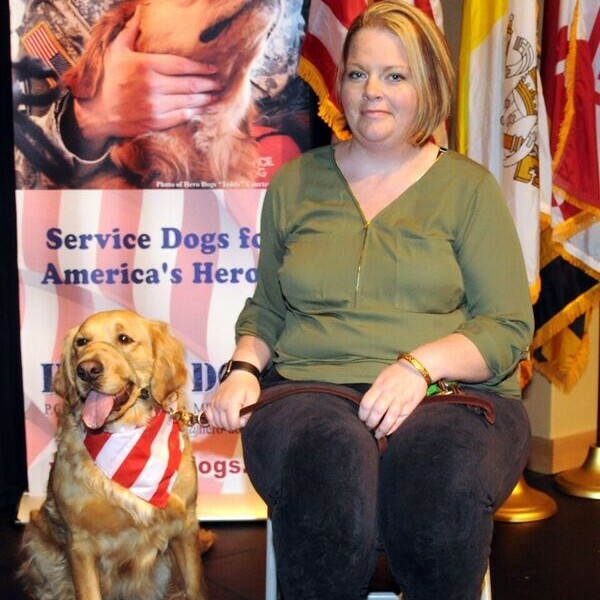 Amber has been in our service dog training program since she was a puppy, and also tried her nose at detection work. Amber is VERY smart, has extensive training and skills, and is quite capable – however, she is a dog with a mind and a will of her own. If Amber’s desires do not coincide with those of her handler, Amber will choose her own path! Amber’s independent streak does not make her a good candidate for a service dog. Amber is friendly to other dogs when she meets them, but she plays rather roughly and will purposely antagonize and intimidate a softer dog. Amber also seriously guards food from other dogs and cats and is a bully to animals she lives with; thus Amber cannot live in a home with other pets. She does not guard from people or children, only other animals. Amber generally has good house manners, although she is not above sneaking on the couch or helping herself to an unattended sandwich. Amber is a young, healthy, and active dog who requires substantial daily exercise. Fortunately, playing ball is her favorite thing in the world so this is relatively easy to accomplish. Amber also loves to swim – even if it is just in a puddle in the back yard. Amber does best when her mind and body are kept occupied. 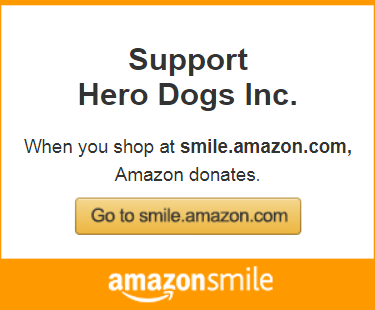 She would enjoy participating in dog sports like nosework, agility, or tracking. With an experienced handler, Amber could be a candidate to participate in our Therapy Dog Program. 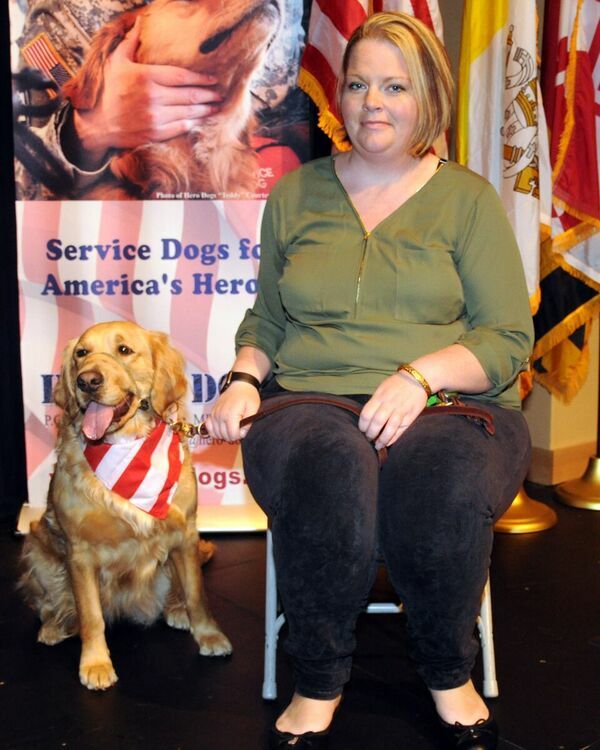 Amber’s extensive skills and training would also allow her to be placed as a skilled companion to a Veteran or military family member with a disability who needs assistance in the home only. There is an additional training commitment required for either of these adoption options. Our highest priority is finding the most suitable adoptive home for Amber, with adopters who are willing and able to meet Amber’s physical, exercise, mental, and emotional needs and are financially able to care for her. Preference will be given to a Veteran adopter. The adoption donation for Amber is $1000. The donation will be waived for a Veteran adopter with an honorable discharge. If you are interested in adopting Amber, please fill out a released dog application. If we feel that you are a potential candidate, you will be contacted to arrange an interview and home visit. Because of the requirement for a home visit, potential adopters must live within ~50 miles of zip code 20833. Click here to read Amber’s full blog.